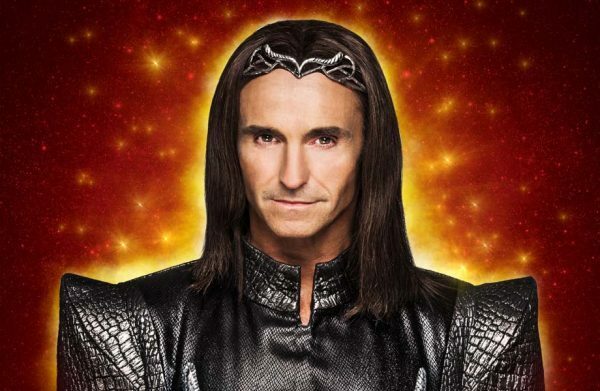 This Christmas former Wet Wet Wet singer Marti Pellow will be treading the boards at The Bristol Hippodrome, playing evil villain Abanazar in the pantomime Aladdin. Vivienne Kennedy caught up with Marti recently for a chat about all things panto. Read to the end and you’ll have the chance to win a family ticket to see Aladdin at The Bristol Hippodrome and spend a night at the Bristol Marriott Hotel City Centre. This will be your third year doing panto… you must enjoy it? It’s been a real revelation to me. I’ve worked with Michael (Harrison, managing director of Qdos Entertainment) before on various productions, The Witches of Eastwick was one of them, and every Christmas he’d ask if I was ready to do a panto for him. A couple of years ago he asked again, and I said if it was possible for me to write for the character and score all the music I’d be involved in, then I’d do it. There was going to be more meat on the bone for me that way and I knew as a songwriter I’d be able to use different platforms, mediums, and soundscapes. It gave me more investment in the show. It’s a different sort of reaction than you get from any other audience, isn’t it? I love that everyone’s role is so defined – he’s the baddie, and that’s the goodie. And you get that heady mixture of it being Christmastime, the kids being so excited, and the mums and dads reliving their experience of pantomime through their children’s eyes. The music’s good. Although I might be a bit biased when I say that. And it’s spectacular; we’ve got some great 3D effects and animatronics. And the way that The Twins FX have designed some of the main events in the show… well, they’re fantastic, as good as any Vegas show. I think you’re all in for a treat. Is it something you saw coming, way back when in the Popped In, Souled Out days? Did you ever imagine yourself doing pantomime? The first ever pantomime I went to see was with Stanley Baxter who was a very famous comedian when I was growing up and a bit of a hero of mine. It was my first real theatre experience and he set the bar really high. So, no, I don’t think I ever saw myself doing it. I always wanted to be involved in the arts though. I’d watch Top of the Pops and stuff like that when I was a child and I always wanted to be a singer. I remember watching musicals when I was young, with my mum. But I never envisioned that one day I’d be starring on Broadway in Chicago… or doing something in the West End… or working with Andrew Lloyd-Webber and Tim Rice… or with the Abba boys doing Chess… or with Idina Menzel… or… no, I never saw these things coming! For me, it was just another extension, another medium, trying something that I might enjoy, or I might not enjoy. Do you ever plan ahead, or just take life one opportunity at a time? None of it’s really been planned. My first experience of musical theatre came through Pete Townshend. Years ago, he asked me if I could do Tommy for him; at the time I couldn’t, I was away doing my own thing, but later on, I did an event at the Royal Albert Hall for him, for the Teenage Cancer Trust, a wonderful charity. One of the guests I was singing with that night was Ruthie Henshall. I’d never seen myself doing musicals but there was a bit of serendipity involved. I think it was always heading my way, but I had to be in a place where I could be disciplined to do it. It’s hard graft and there was a fear of the unknown. I can sing… I knew I could do that… but there are some different skills here that I had to explore. I was scared! I can still remember my opening night on Broadway, I was thinking: “woah, no, no, no, no, no!” and then away I went. I remember thinking: “I never saw this one coming”. But I think it’s great when other people can see things in you and inspire you to come out of your comfort zone. And I’m lucky to have an audience that have afforded me that luxury, they’ve come on board the journey with me and supported me on it. Yes, I’ve spent the last month writing original songs that will only live for Bristol. Is that a very different process from trying to craft a chart-topping song? Indeed. A lot of the underscore for my character is very different from everything else that’s going on. I can use different chords and progressions, so the audience feel it; before they see me, they already know something about me. It’s not all “dum de dum dum dummmm” though; there’s a different cadence to the soundscapes I’m using, and I find that fascinating. You’re playing Abanazar – does he have any redeeming features or is he an out-and-out baddie? I’ve written a song called Why Does No-one Care for Me?, because it’s inconceivable that you wouldn’t fall in love with me! I love the idea that he’s only person in that auditorium that’s not switched on to the stupidity of him. I think that’s what makes it so good. It’s so easy to be seduced by the sound of laughter and to want a piece of that. But that’s Joe’s job (Joe Pasquale is playing Wishee Washee) and he’ll do that in spades. A couple of times I’ll maybe let my guard down but I’m the straight guy, all the madness that will be going on is stupid to me and very frustrating…just give me that lamp! You mentioned there’s some pretty amazing effects… do you have a favourite moment? What should we be looking out for? The opening of the show is fantastic. The kids will love it. I don’t want to give too much away but it really is a great opening. The 3D sequence is brilliant too. I like to watch the audience when they’ve put their glasses on. It’s quite a surreal image to look at and I just love people’s reactions to it, especially when the kids try to reach out and touch things. Aw, Joe’s a very generous man. I met him a couple of years ago when we were rehearsing for the Birmingham production. He’s a sweetheart. I think it’ll be a tough one for me, I know I’ll end up biting my lip quite a lot. I am the worst (when it comes to trying not to laugh). Sometimes it’s so hard. He’s a natural comedian, his improvisations are fantastic, and you’ve just got to roll with it, while trying to keep a straight face. I found out then about your incredibly tight rehearsal schedule (they get two weeks… two weeks) and I already knew how long a run it is (9 December-7 January). What I didn’t realise until today is that you do two shows every single day…well, except Mondays, they give you Mondays off. How do you prepare for that? I actually find that schedule quite comfortable. Is that a bit strange? There’s a discipline within that. A structure to my day and I love that. Once I come in, I’m in and ready to go. And I’m almost always first in. Yes, I’m looking forward to singing a few songs. Colston Hall was one of the first places I played in Bristol, many, many years ago. I did a big tour this year and I’ve sort of fallen in to doing this Private Collection thing, which is well suited to smaller venues (although I know that’s quite a large one). I just come in and sing and chat and play the records I like. It’s no biggie. That will be a bit of a flying visit and with most musicals you only get to come for a few days or a week, are you looking forward to an extended stay and having a bit of time to explore? I first came to Bristol well over 30 years ago and I’ve been back quite a few times since. There’ve been some big changes but it’s an exciting city. It’s got a great youth culture and student crowd so there’s a real vibrancy here. And within the arts it stands very, very tall. There are some great record shops and I love places like St. Nicks – you can spend a day just wandering about there. I’m really looking forward to spending some time here; there’s plenty to do! You just mentioned Bristol doing the arts well; we’ve got some great theatres here and they’re all putting on good Christmas shows – why should people choose Aladdin? It’s going to be fantastic. The production values are amazing. Plus, I know there’s great support from the community for this theatre… this lovely, big, old theatre. This is your pantomime, own it, come and see it. But most of all come because it’s a great production, really top drawer, and I think it will be one of the best pantomimes you’ll ever see. Aladdin opens at The Bristol Hippodrome on Saturday 9 December and runs until Sunday 7 January – click HERE to find out more and to book online.